We've recently added more than 330 Bevco Ergonomic Seating 9000 Series Chairs to QSource.com (adding to the hundreds of other Bevco seating solutions we offer online). This top-quality line of regular, cleanroom, and ESD-safe chairs come standard with a number of impressive features and also provide a variety of options to allow for customization to your exact requirements. Bevco's 9000 Series features adjustable backrests with lumbar support, pneumatic height adjustment, 360º swivel, and 300-lb. weight capacity as standard specs. Depending on the model, there are options based on cleanroom class, height adjustment range, color, material, and type of glides. Visit our Web site or contact us for assistance with building seating solutions to meet your needs. 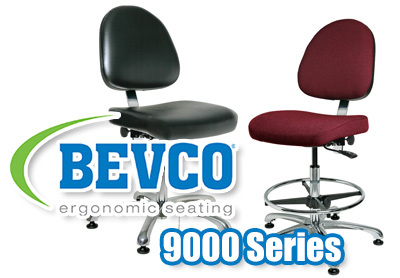 To purchase your Bevco 9000 Series Chairs, please visit the 9000 Series Department at QSource.com or visit the Bevco Ergonomic Seating page for our full selection of Bevco products. You may also contact us via our Web site, by phone (800-966-6020), or by email. If there's a product or topic you'd like to see The Q Source Resource write about please let us know. We'd also appreciate if you share this blog post with your friends and colleagues via the social media links below. If you have questions or comments about these exclusive Bevco Ergonomic Seating products, please either leave us a message in the comments section or contact us directly.